Row By Row Experience > 2015 Row by Row Pattern "Run Through the Sprinklers"
2015 Row by Row Pattern "Run Through the Sprinklers"
2015 Row by Row PATTERN. Unfinished dimensions: 9.5" x 36.5" Alternate size included in pattern for wall hanging or table topper, finished size: 12" x 42"
Full Size Banner Roll PATTERN. Our row is constructed with a pieced foreground and sky to create our landscape base. The sprinkler and hose components are appliqued using the method of your choice. Hand embroidery stitches are used for the blades of grass and drops of water to form the sprinkler's spray pattern. 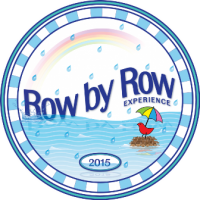 Specially created for the 2015 Row by Row H2O Experience! Our shop has a large collection of vintage sprinklers on display. Unique for a quilt shop - true, Dawn Farrier, owner and Row designer paid homage to one of her favorite childhood pasttimes...Running through the Sprinklers!